Organizations face big challenges: whether it is an accelerated rate of change, the threat of disruption, ambitious targets, or aggressive competition. For over twenty years, JP Pawliw-Fry’s curiosity and passion for helping people manage their emotions has driven his research into the skills and tools required to build a culture of exceptional leadership. As a highly captivating speaker and thought leader, JP brings his passion, humor, and engaging stories to every keynote. He challenges groups to think differently about human behavior and leadership, and how to manage the pressure that is overtaking so many organizations and individuals today. JP shows people how to leverage the power of the science of emotional intelligence, and to embrace pressure and manage disruption. He engages the audience with interactive opportunities to learn and strategies they can implement immediately. A renowned author, JP embedded his learning and stories into the New York Times bestseller, Performing Under Pressure: The Science of Doing Your Best When it Matters Most, co-authored with Hendrie Weisenger. JP’s clients have included leaders from Fortune 500 companies such as KPMG, UGH, and Allstate, as well as the US Marines and Olympic athletes, to name just a few. Research is clear that some leaders are better prepared to handle and lead their people through these challenges more than others. 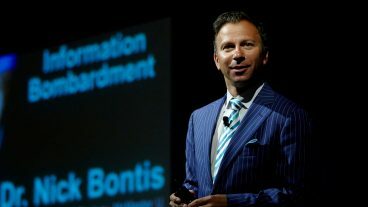 In this powerful keynote, based on the New York Times bestselling book, Performing Under Pressure, The Science of Doing Your Best When it Matters Most, your audience will learn how to leverage pressure to help them get to the other side of performance and succeed in achieving their most challenging goals. If the Hippocratic Oath main directive is ‘first, do no harm,’ then the brain’s is ‘first, keep alive.’ Yet the usual approach most organizations take in managing change and disruption does not take into consideration this neurological reality. Leaders bring their ‘five-point strategies’ or get overly focused on the latest technology and completely miss that real change happens in the mind, and more specifically, in the brains of their people. An introduction to the practice of Mindfulness; its practice and health benefits. Research is clear: Emotional Intelligence (EQ) is the single greatest contributor to personal excellence and leadership. Increased EQ leads to increased resilience in the face of change, enhanced performance, better communication and greater success! The Managing Yourself and Coaching Others curriculum has been designed to empower individuals to take more responsibility for their behaviour and performance. These two sessions, when combined, create a powerful and lasting learning experience: Self-Awareness and Emotional Management, and Emotional Connection: Coaching and Inspiring Others. The following sessions, when combined, create a powerful and lasting learning experience. Each session can be delivered in half or full days. Dr. JP Pawliw-Fry’s training programs are facilitated using engaging presentations of key concepts, a variety of group and individual exercises, discussions and case studies. These exercises help to motivate, illustrate key learning points, demonstrate important skills and ‘drill down’ to the drivers of behaviour. This session allows individuals to understand and practice the Three Conversations of Leadership: Daily Conversations, Difficult Conversations, and Courageous Conversations. While daily conversations help build relationships based on trust and respect, difficult conversations allow you to give honest and candid feedback, hold people accountable, and give bad news in a way that ensures the person feels valued. Courageous conversation techniques allow you to speak your truth when there is tension and conflict. Practice the skill of having Daily Conversation that build relationships based on trust and respect. Learn the Art of Courageous Conversations: techniques to speak your truth when there is tension and conflict. All of the Dr. Pawliw-Fry’s training programs are facilitated using engaging presentations of key concepts, a variety of group and individual exercises, discussions and case studies. These exercises help to motivate, illustrate key learning points, demonstrate important skills and ‘drill down’ to the drivers of our behaviour. According to this NY Times bestselling book and top ten book of 2015 (Inc. Magazine), nobody performs better under pressure. Regardless of the task, pressure ruthlessly diminishes our judgment, decision-making, attention, dexterity, and performance in every professional and personal arena. In Performing Under Pressure, Drs. Hendrie Weisinger and J.P. Pawliw-Fry introduce us to the concept of pressure management, offering empirically tested short term and long term solutions to help us overcome the debilitating effects of pressure. Best keynote presentation I have been to in years! Very different than the usual: extremely interesting and powerful – yet highly entertaining. It is not often I hear someone who can really ‘put it together’. Dr. Pawliw-Fry is impassioned and enthusiastic. JP is an inspirational presenter and he infuses passion into his material… He can take complex ideas and simplify them, giving the members of the audience real solutions they can easily implement.